UK writer for new system project? Looking for a writer collaborator in London UK for a new IF system project. By “system project”, i mean to be hosted on a completely new IF platform rather than any of the traditional ones. I will develop this platform but i need an author to make it real (i am not a writer). New because i want it to run well on mobile devices and make use of touch based user interfaces. I had in mind something along the lines of a touch-based text game with illustrations, icons and sound effects. It wont be a parser based game, nor choice based although choices could feature. Sorry, i should have made this clearer. Not a paid position. The idea is a new project venture. The plan is to build a system to author directly to mobile devices, the results of which will be released on the iOS and Android app stores. Windows/linux/mac are also possible if desired. Any monies made will be split equally. I forget where I read about this, but “contribute your work to my new project venture, I can’t pay you up front but will give you a share of the hypothetical money we make” is not an appealing pitch. Anyone who is going to work on spec, or for free, is engaged in a labor of love, and they will want be doing their project that they love. I agree. no one’s going to do this unless it’s a project that is just as much theirs too. So that’s what i’m offering. I’m not asking for someone to write a story from my design or specification and i’m not going to impose any criteria on content (within reason). It seems to me that people like to create works and are creating works and this is a new possibility for their work to reach a wider audience. Have you checked out Yarn? It appears to cover the bases you’ve mentioned so far. Not saying another platform might not have its merits; just that (as an author, not a potential collaborator) I’d want to know what the new platform offers that Yarn doesn’t. Yarn does look good. They’re doing a slick job, but yarn is not an authoring system. What is their business model i wonder? But this does show we’re seeing a shift towards a much more polished game experience. This is the way things are going. well done yarn! The interesting point is that this validates my idea to target mobiles with a new, mobile specific engine. That why i wanted to design and build a new authoring system. Although i get the impression that yarn will be well implemented and smooth, it will be constrained by the fact the underneath it’s running twine or choice. eventually that could be a problem. It will mean its games cannot break free of the limitations of those authoring systems. However, that is by no means a criticism of yarn itself and it does look good. I do not plan to build a games container. The idea is each work runs as a standalone product. This means the underlying technology has been tested to work with that content. The reality is that the technology will change and evolve, so that subsequent versions of the system will do more. I don’t want to be re-testing the back catalogue. Also, it’s likely that any collaborator will have some requests for the tech. And this will be true for each new product going forward. My aim is to work closely with any collaborator. any tech i write must bring out the best in their work because success requires the fusion of complementary skills. What does your new system look like, and what does it do? Like this except the fire burns. I can have effects like weather and atmospherics on pages. also on mobile. Right now there are a lot of these mobile platforms popping up. You say you have the feature set “in mind” so that implies you’re not very far along. I recommend getting at least a prototype and/or a detailed feature list with descriptions nailed down, differentiating it from other IF creation tools. My favorite thing to do is explore new authoring systems, but I don’t get excited about something “along the lines of touch based with icons and sound” and “not parser or choice”. I’d want to see where you plan to go with that. If you know what you want to do, I’d recommend searching IFDB for a story you think will work well in your system, obtain permission from the author, (or use the standard “Cloak of Darkness” which is like the “Quick brown fox jumps over the lazy dog.” standard test for IF systems), and then implement in your system as a demo - even just detailed mockups. 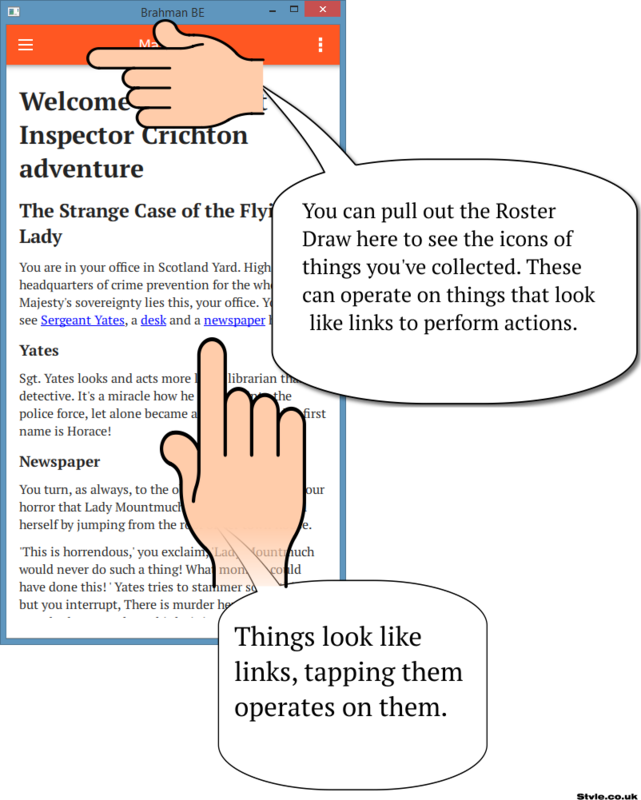 A unique UI or interesting presentation or ease-of-use authoring tool spelled out and hopefully shown with examples goes a long way toward getting someone interested in your concept. I see you’ve shown some pictures…but a design document will be key. Burning fire isn’t a feature. A drawer of inventory items is, though, I want more stuff like that. How in the code will this be accomplished? And I’m not asking you to reply directly here and show me, I’m suggesting you get this all together as a complete thing so you have something that will be more likely to attract a prospective author than an idea, especially if you hope enthusiasm is their reward. There’s some more info up about jkj yuio’s system Brahmin here. You are right that I’m not far along. Although i do have a lot of bits that could be put together; just a matter of time and effort. i have no doubts it could be done. One of the problems i have is a chicken and egg one. Basically, if i can’t get content, then there’s no point in me wasting my time building the system. 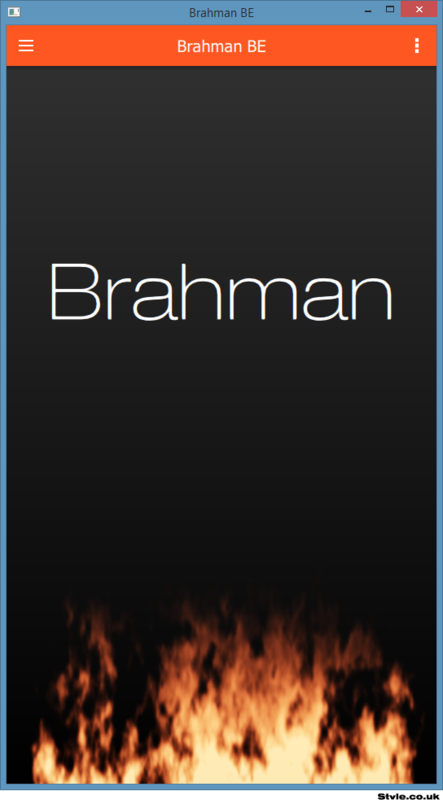 Right now i have a number of projects on the go and Brahman is just one competing for time. Brahman will, at least, have a different flavour than the others. It’s not a question of being better but just different. Being different establishes a style and a brand. There will definitely be unique features and I plan establishing a balance between choice and objects. choice with an inventory, could be a thing. There is definitely a move toward mobile platforms. I see this as an opportunity to reach a much wider audience. I think authors stand to lose out if they don’t get on this wave quickly. The top games on IFDB are mostly also published through Choice on the app stores. I would have expected somebody to be interested in an alternative that doesn’t keep 75%. Let’s turn the tables here. Suppose i said, you write me a story that uses objects and choices, and if i think it’s good enough, I’ll make it into an app and give you 25%. How keen would you be? That’s your Choice choice right now it seems. Suppose you said to me, you’re too scared to try something new and can we make choice games? Choice script, for example, is very simple. I could write an interpreter for it (or a variation) in about a day. Making the first app framework to host it might take a month. Let’s say, in two months you could have a product in the app store. Have a look at Choice games on Android, their prices and download counts. Bear in mind that often the download counts are by territory and not worldwide. The math tell you that some make quite a bit and some don’t. But mostly they’re not too terrible and, importantly, sales are ongoing. Instead, I would split the proceeds and you’d get a deal. And we operate in a slightly different market space. ie not head on. The idea is people buy games, they buy our games and they buy Choice games. Games are cheap; like $1-$5 so why wouldn’t they buy both. I have a business tenet when working with partners: they have to bring their own enthusiasm too. It sounds good that i should build a demo, with samples and documentation to curry interest. But then who’s pulling and who’s dragging? Someone only vaguely interested after seeing almost a working product, is someone who’s going to flake when the going gets tough (and it always does). I can build this thing no doubt. A lot of details are to be finalised for sure, but if you were partnering with me on forming a new games company, wouldn’t you be interested in a say on those details.